Ruskin became a distinct community when a co-operative society settled at the mouth of the Stave River and started operating a sawmill they named Ruskin Mill. The number of members of the society justified the establishment of a school and a post office with the name Ruskin. After only a few years the co-operative failed but the sawmill operations were taken over and expanded by E. H. Heaps and the lumber industry grew quickly into a major operation. Ruskin kept its name, its own school, the Ruskin post office and with time a train station was added to its amenities. 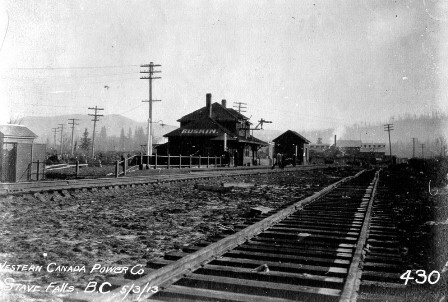 Lumbering remained a main source of income for Ruskin residents as did the construction and operation involved with the production of hydro-electric power – the Stave Falls dam and later the Ruskin dam. Between the two World Wars, even more so than in Whonnock, Japanese residents owning half the agricultural land in Ruskin developed fruit growing into a major industry. View archival photos of Ruskin at our Flickr site.